I love Paul Gautschi's way of pruning fruit trees. After watching his pruning videos, I ran straight out with my pruners and saw and started cutting. All in all I am really happy with it. I can see that I did it right and when it bears fruit it will take on the classic Paul style of drooping bent branches. They really look like Halloween trees to me. I love them. Lesson learned...get a super sharp pruning saw like Paul's. Mine really ratched parts of my tree, but it will heal. It was really fun!! Who knew pruning could be a blast. Just watched the video - thanks for the link, Erin. It all seems to make sense and I'm going to give his method a go on my plum trees as they're getting very tall and the tiny fruits always fall off - lack of light? Perhaps, let's see! Caro!! I lost all of my plums too. It started put with hundreds and now I have 13. I did some reading and found out the Japanese Plums need a pollinator. Who knew? 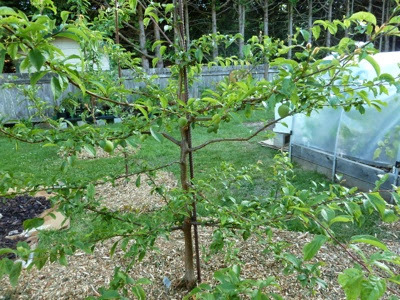 So I am getting a purple Japanese Plum to pollinate it. Yummmmm. Hi Erin! I had to look up Japanese plum (prunus salicina); it appears to be a variety unfamiliar to European soil. 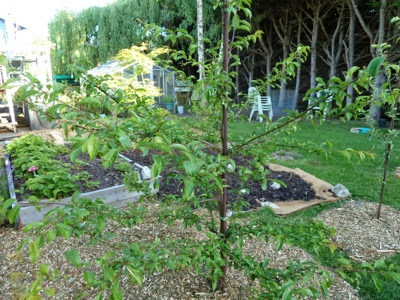 My plum trees are Victoria plum, a well known English variety which is self-pollinating, although I do have two trees. 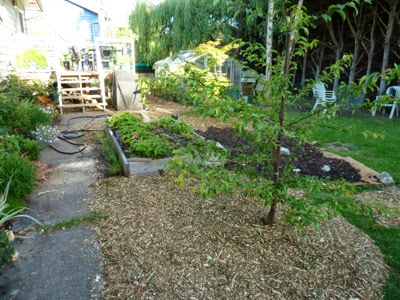 I think it might do better if I had another type of plum to pollinate it and certainly I'll be giving it a good summer prune in the style of the video - I love the final look of those trees - but I think the trees in the video are all apples? I think they are all apples too Caro. Aren't they just so beautiful pruned that way. I did end up getting a set of Felco pruners and the Samarai saw that Paul uses.